This weekend I spent rather a lot of time with this tiny fella. 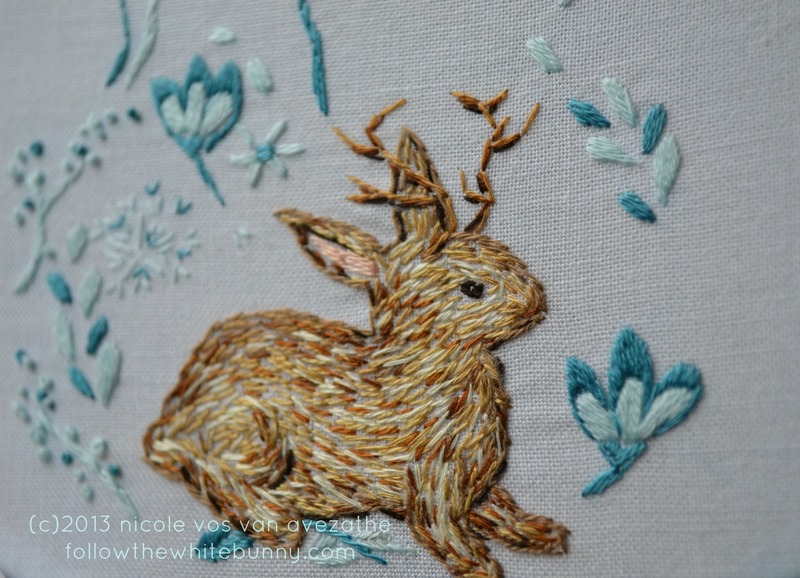 He's based on this free pattern of mine from a couple of years back and over the weekend he magically evolved from a white bunny into a brown Jackalope. I had a lot of fun stitching the flowers and leaves around him and I definitely think these will return in a future pattern or two! Some of those were inspired by this pattern I recently shared and some of the inspiration probably came from the Stitched in Scandinavia book I reviewed last week. I used some of my favourite shades of blue from the DMC six stranded flosses for the flowers: no 3810 and 775. And probably about eight different colours of brown, beige and cream shades for the Jackalope. Everything was stitched with just one strand of floss and sometimes I even wished there was such a thing as half a strand of floss for the tiniest details! He is incredibly cute. The colours of the flowers are gorgeous too. Oh, that is just too darn cute. Wonderful stitching you did, Nicole. Lovely. Oh Nicole, I love this guy SO much. I love all your little creatures, they have such personalities in them!, but I have a special love for jackalopes. He's enchanting!